Vegan Runner Eats » Running Wisdom » Holiday Running Streak is Over: What I’ve Learned from the Experience of Running Every Day through the Holidays. 3) To find out if there is some ‘secret knowledge’ that daily runners possess and keep in secret from the rest of the world. – Keep going even during traveling (Thanksgiving in Florida, Christmas in New York). – Add this to the fact that I wasn’t going very far every day (lots of 3-4 mile runs), so I never felt like I was exerting myself too hard, or that my runs took too much time out of my days. Verdict: Running every day is actually quite doable! Especially if you keep most runs relatively short – whatever your definition of ‘short’ might be. And now- the wisdom-sharing part! 1. Daily running can make you a better person. Those daily sessions of about half an hour (or more) prove to be incredibly soothing for the nerves: I was happy to experience a relief that those runs provided during the busy holiday time that’s usually too stressful for my introverted self. Besides, a commitment like this can take us to a whole new level of self-discipline. And of course, we can learn something new about ourselves: for me, it was the realization that I can run well in cold temperatures! If I didn’t have that commitment to my streak, I would have never found that out because I wouldn’t have gone running in 32-degree weather. 2. Daily running can make you a better runner. Naturally, you become more efficient at any activity that you do a lot (that Malcolm Gladwell quote about 10,000 hours comes to mind – not that I spent that much time running during this streak, of course!). Here’s a fitness dilemma: Our muscles and cardiovascular system tend to advance faster through physical activity than our joints and connective tissue. Daily running can help tendons and joints in our lower legs and feet become better adapted to all of that road pounding we put them through while running. Ever heard of very fit non-runners who enter longer road races and burn out miserably? That’s because only running can prepare you to be a more efficient runner. 3. Daily running may make you a faster runner, but not necessarily. Getting more efficient at running doesn’t guarantee that you’ll become faster. Any running expert can tell you that in order to get faster, you need to add speedwork to your weekly runs, like running on a nearby high school track with every other lap a little faster, or adding speed pickups of 20-30 seconds during a medium-length run once a week. (You can find much more advice on speedwork on the internet.) I’ll admit that I haven’t done much speedwork lately because of a sore spot in my left foot that’s been bothering me for a few months – I just don’t want it to flare up and turn into a full-blown running injury. However, I’ve noticed that my runs got faster since the temperatures dropped. Now that we’re having the coldest weather on Gulf Coast since I’ve moved here seven years ago (18°F this morning), I just might surprise myself again! 4. Daily running can make you fitter – or at least prevent any weight gain during the holidays! I rarely put on much weight, and now that I’ve switched to a plant-based diet, my weight has been very stable even when I stuff myself with food. However, the statistics shows that most people tend to put on at least one pound during the holidays (see more on the subject in this New York Times article), and then never lose it. Daily runs are a great activity that can prevent your weight from creeping up. Add to this a plant-based diet, and you’ll emerge from the holiday season healthier than ever! 5. Daily running can be addictive. I noticed this on days when I had to move my runs for later in the afternoon: my body was used to that quick boost of endorphins first thing in the morning, so if I didn’t go running in the am, I could get moody and less productive. Not good if the very reason I skipped my morning runs was to get more stuff done that morning! 6. Daily runs can be too much, and even lead to an injury if you’re running too long/hard, too often. Ideally, a running streak of any length is only recommended to people who’ve already been running 3-4 times a week for a few miles at a time. If you’ve never done any running before, please don’t try to attempt daily runs! You’ll be much better off starting easy, with shorter runs every other day. Better yet, do plenty of research and read some running-specific articles online (RunnersWorld.com and RunningTimes.com have lots of useful info). 7. Shorter runs are great for starting the day right when I’m too lazy (or don’t have time) for longer runs. I used to run this 5-mile loop in my neighborhood a couple times a week, and I thought that anything shorter was beneath me. Naturally, before long I got sick and tired of that loop, so I would often skip the run altogether. I’m glad to know now that I can still crank out a short run on days I don’t feel like running, and reap all the benefits of physical activity. 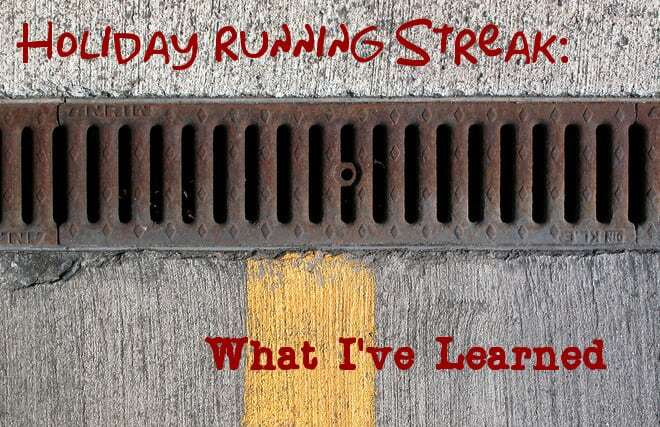 All in all, this Holiday Running Streak turned out to be a great experience: it proved to me that I can run every day safely, and helped me learn some things about myself that I didn’t know before. Would I do it again? I’m sure I would – maybe even for a longer time, and during a different time of the year! To see week-by-week reports about my Holiday Running Streak, click here. This Sunday, February 12, 2014, I’ll be participating in a relay race in Mobile, Ala., during First Light Marathon. During the relay, our team of 5 people will run the distance of the marathon, one person at a time, in 5-mile parts (the last part is 6.2 miles). I’ve never done a relay before, so this should be fun! Please wish me luck! Tagged 2013 Holiday Running Streak, exercise, Forks Over Knives, inspiration, motivation, running, running challenge. Bookmark the permalink.